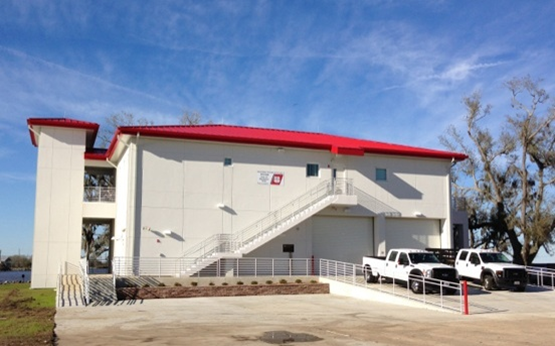 USCG Station Dulac ANT is a new 2-story 16,400 square foot essential facility designed to withstand Category IV hurricane wind and storm surges. The facility is located in the lower marshes of South Louisiana and is supported on a deep foundation system consisting of precast concrete piles and cast-in-place concrete grade beams. The flood prone level of the structure has cast-in-place concrete columns and shear walls as well as masonry break-away walls. The inhabited level of the structure utilizes a galvanized steel frame with a composite steel and concrete deck, masonry walls and cold formed metal roof trusses. The facility is designed to be self sustaining following a hurricane event and includes an 8,000 gallon propane tank support and anchor platform. A secondary structure on the project is a 100 square foot flammable/explosive material storage building for flares and signal devices.